Brian is a real powerhouse of traditional music and song. 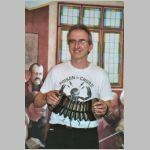 He is hailed as one of the finest ballad singers around while his playing of melodeon, concertina and guitar will have your feet tapping and your hands clapping for more. Be early, he is a very popular guest.